When I was a small child, I was always delighted at what the Easter Bunny brought me on Easter morning. My favorite treat was the cheap plastic chicken that laid plastic eggs when you pressed down on its legs. Remember those? After I discovered that my parents were in fact the Easter Bunny, Easter morning didn't lack for excitement thanks to the more grown-up Easter eggs that my sister and I started to receive. For a period of a few years, my parents always gave us Limoges egg boxes from Tiffany & Co. (Although one year, the egg was by Halcyon Days, not Tiffany. You can see some of the eggs, above.) It was really a nice tradition that I believe ended, unfortunately, when I went off to college. 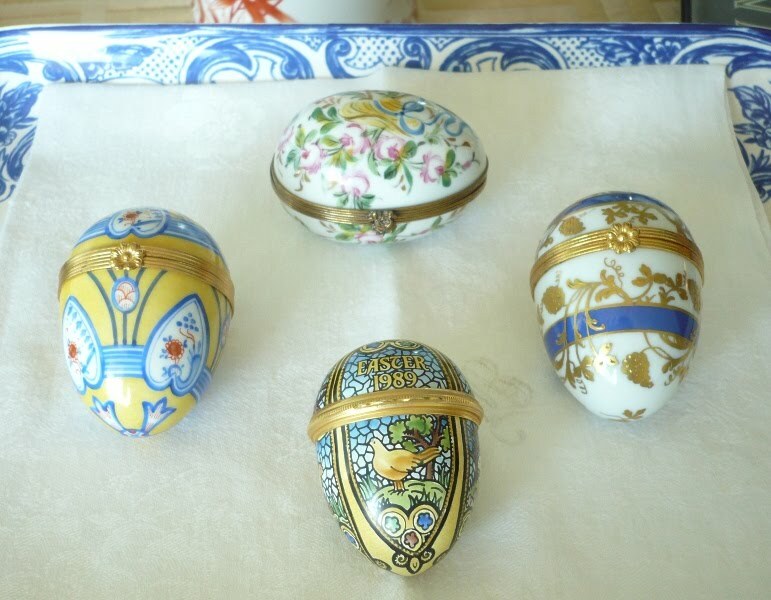 Never was the tradition of giving jeweled or porcelain eggs on Easter day more spectacular than when Tsar Alexander III commissioned Peter Carl Fabergé to create masterpiece eggs for his wife, Tsarina Maria Feodorovna. 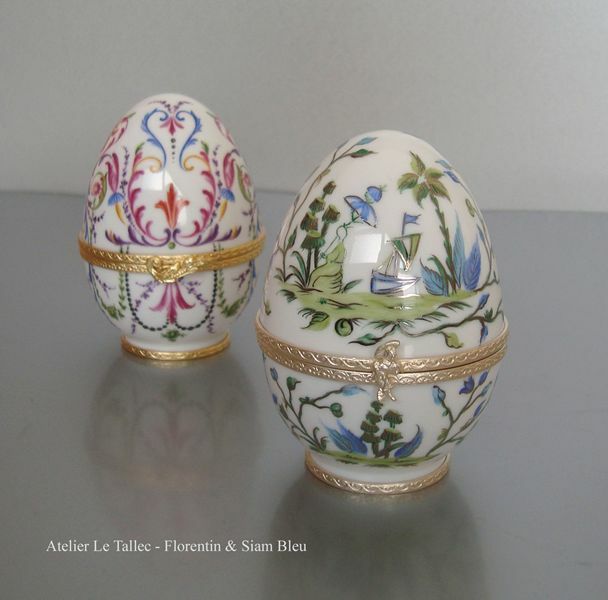 The first Fabergé egg that Alexander presented to the Tsarina was enameled, and hidden within the egg was a golden yolk that contained a golden hen that in turn held a tiny diamond royal crown and a ruby egg. Now that was an egg. Alexander III's son, Tsar Nicholas II, continued the tradition of commissioning Fabergé eggs for the Easter holiday until the Russian Revolution cut short both his reign and his life. While Fabergé eggs may be out of reach for most of us, there are all kinds of wonderful eggs that one can collect or give as gifts to others. There are versions in papier-mâché, porcelain, silver, and even malachite. But truth be told, I still have a soft spot in my heart for plain old dyed Easter eggs. That was the one craft project that I could do as a child with semi-successful results! Marjorie Merriweather Post owned this fabulous Fabergé egg, now displayed at Hillwood Estate Museum. Porcelain eggs from Atelier Le Tallec. 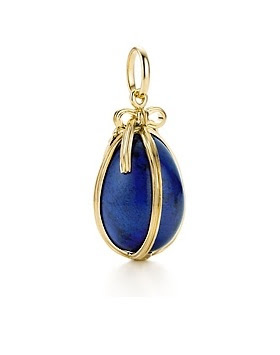 I have always loved (and always wanted) a Schlumberger egg charm. This one is lapis. 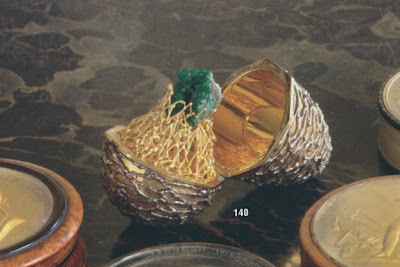 Silversmith Stuart Devlin is known for his highly collectible egg boxes. This one which contains a surprise hummingbird dates to 1976 and is available through Styles Silver. 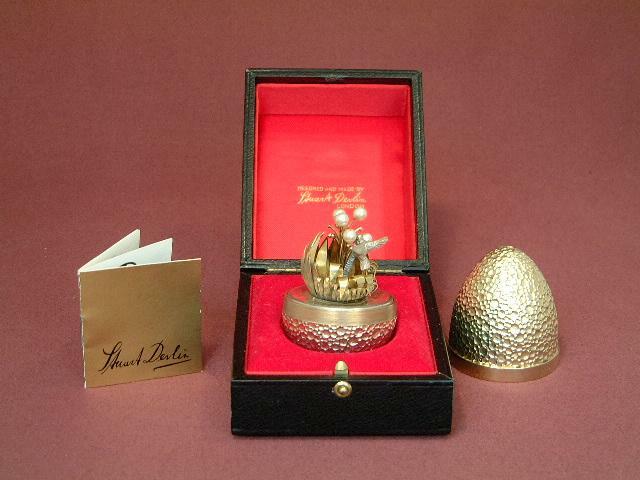 Bill Blass owned this Stuart Devlin egg that was made in 1969. How sweet are these vintage German papier-mâché eggs that can hold candy? At $6.50 each, you should buy a dozen. Available through D. Blümchen & Company. A blast from the past, as it were. I'd forgotten both about Devlin and his fellow metal smiths. Lovely things and actually quite affordable which they never were when I first saw his work. I love the violet vase. 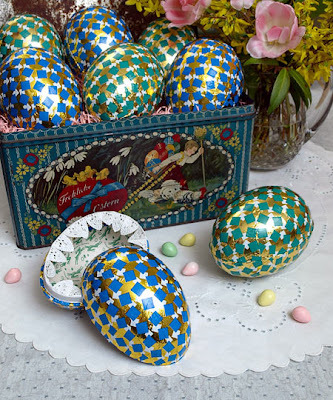 The Faberge eggs are exquisite but I will settle for the German papier-mache eggs. Objects of such beauty and exquisite craftsmanship! Thanks for sharing them, Jennifer. I cannot thank you enough for posting the link to www.blumchen.com!!! I just put out my Easter tree this last weekend, and was looking for printables for some DIY ornaments. The website is fab and perfect for vintage printables!!!! yay!!!! Lulu- I felt the same way when I visited the website! So many great things!!! As someone from Virginia, I have been spoiled over the years being able to see many, many of the Faberge eggs and other pieces in my lifetime. I also was a bit of a Russian history geek growing up, and own about 40 books on the Romanov empire and family! Fun to see the Easter eggs. Worthington, I should have consulted you on this post!! Sounds like you know a lot about Russian history, something that I also find fascinating.